Cancellation policy is moderate- Any Cancellation will incur $400 cancellation fee plus credit card charges. 50% of remaining will be returned if cancelled 30 days before visit. No refunds is cancelled within 30 days of visit. We are so glad to be a part of your relaxing visit. We started as homeowners right in St Augustine and the Vilano and Ponte Vedra Area. We take pride in our business, our Properties and we love to travel too! Our family thoroughly enjoyed our stay here to celebrate our parent's 50th wedding anniversary! Lovely home and a short drive to all of the downtown attractions. We were looking for a place to stay in St. Augustine to celebrate our wedding! We only had a handful of guests, and the owner was wonderful to work with us to allow this celebration. The home was large, well furnished and was simply gorgeous. We stayed a few days after our wedding date and found the kitchen stocked with all the dishes, pots/pans, basic pantry items, you name it. We were also just a few minutes away from the downtown area where there were cute shops and restaurants. We couldn't have asked for more and got so much more that we had expected. We really enjoyed staying here and recommend it to anyone wanting to stay in St. Augustine. We were a group of siblings who grew up in St. Aug and returning to celebrate a family birthday. The house layout was excellent for us. The kitchen had all that we needed to prepare dinner a few nights and a family New Year’s Day meal. Short walk to the beach. We would come back! The home is very spacious and easily accommodated 7 adults. 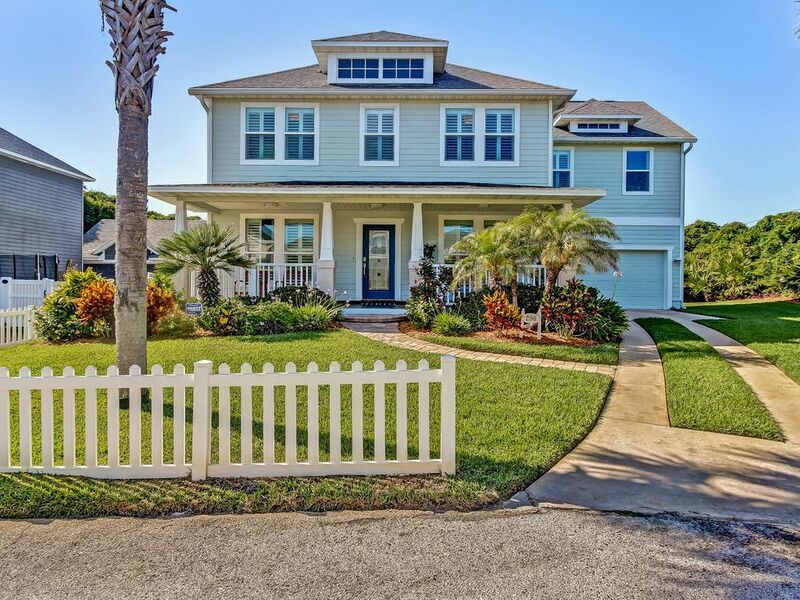 The location is perfect - a two minute walk to the beach and less than a five minute drive to Publix. There were little things that were annoyances during the stay - one roll of toilet paper per bathroom, slow draining sinks (i.e. basically clogged) in two bathrooms, a towel rack that was not tightened to the wall, dying batteries in the smoke detectors, and the dishwasher has issues. If you can bear the annoyances, or if they can be rectified, then this house and location is a great rental. Great house and great location. Well appointed kitchen — we were able to cook a full Thanksgiving dinner there. Great house for a family trip. This was a wonderful place to stay! It is spacious, very clean, across the street from the beach and close to shops and restaurants. We looked into staying at a hotel and this house was almost the same price for our group of 5 adults and 3 kids. The property manager was very helpful and friendly. Would definitely recommend!